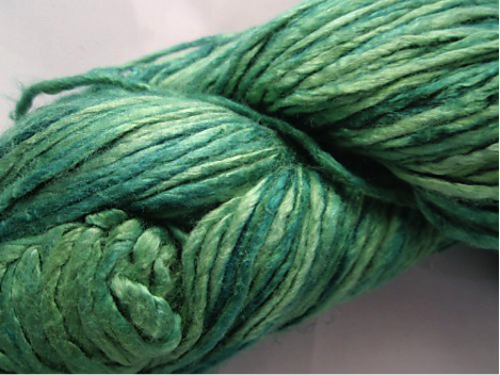 This entry was posted in knitting, yarn and tagged forest, green, Knitting, silk, yarn. I have combined a 2 ply silk with a 2ply wool and made a sweater , it was a long time ago but I remember it being surprisingly heavy. The feel of it was luxurious though. II have not used silk alone and I too have some in my stash in oyster and in peach – good luck! Beautiful colors indeed, and the forest theme is well chosen! I love knitting with silk. It is so soft and pretty and it will shine more as you handle it. I knitted mittens and socks with it and was very pleased with result. As to the patterns: knowing your love for the country and care for the environment, ‘Queen of the Forest’ is the most appropriate! Hugs and Kisses from the other side of the pond. Beautiful colors. I haven’t worked with all silk but often knitters comment on how difficult it is to keep woven ends in. The yarn tends to be slippery that way. Thank you for the advice, I didn’t know about that!